On one hand, San Diego is sad to lose it’s football team. 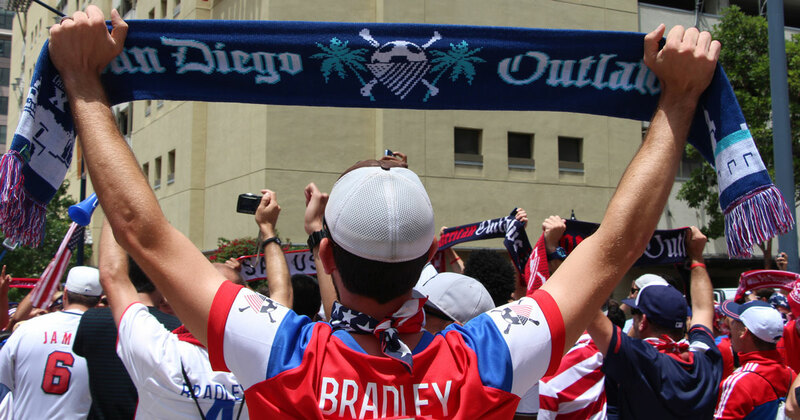 On the other hand, California’s Beach City and it’s local supporting group The American Outlaws (pictured above) are excited to host and march to upcoming International and local fútbol (soccer) matches and tournaments in 2017! The U.S. Men’s National Team will begin the 2017 campaign with a friendly against Serbia on January 29 at Qualcomm Stadium in San Diego, California. Kickoff for Bruce Arena’s first match back in charge of the U.S. MNT is set for 1:00 PM PT, and will be broadcast live on ESPN2 and Univision Networks. On Sunday, July 9th, San Diego will host an opening CONCACAF Gold Cup round double-header at Qualcomm Stadium featuring the Mexican national team as the seeded nation of Group C.
Beach Soccer Jam is a Faster, Hotter Version of the World’s most Popular Sport filled with Entertainment. Come enjoy the excitement including Beach Soccer, Brazilian Samba and Capoeira dancers, some of San Diego’s best Entertainment DJs and a Beer Garden. The Beach Soccer Championships has become one of the premier beach soccer destinations on the west coast of the United States and is among the top beach soccer events in the Nation. If you want Sand & Soccer with FUN, The Beach Soccer Championships is the place to be. With more than a dozen championships throughout it’s close to 40 year history, the Sockers are San Diego’s premiere indoor soccer team! Experience the excitement of this fast-paced game with an affordable trip for the whole family to San Diego Sport Arena. The seasons kick off in October and run through Spring, so there is plenty of opportunity to join the Seventh Man crew! Established in 2015, the North County Battalion joined the United Soccer League’s (USL) Premier Development League (PDL) for the 2017 season and plans to quickly move even further up the U.S. soccer hierarchy in subsequent years. This entry was posted in Golf & Sports, San Diego Events and tagged special events, spectator sports by Brent Bernasconi. Bookmark the permalink.